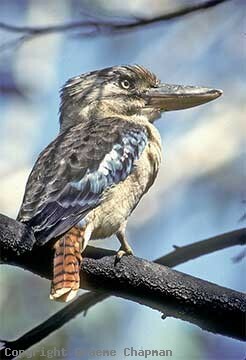 If you think Laughing Kookaburras are noisy, you should hear a group of Blue-wings!! 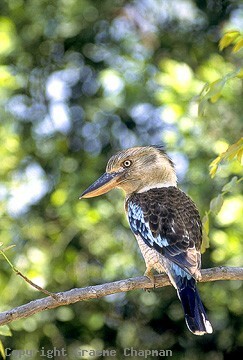 Blue-winged Kookaburras occur right across northern Australia (and southern New Guinea), south to the Pilbara region in W.A, and down to near Brisbane in Queensland. Right down the coast of Queensland, they overlap with the Laughing Kookaburra, albeit in different habitats in many places, but they can occur in adjoining territories, where sometimes there can be aggressive interaction. Blue-winged and Laughing Kookaburras have very similar life-histories but Blue-wings perhaps prefer slightly more humid habitats nearer to water in some places. and choose a greater variety of nest sites, such as in arborial termite nests and in baobab trees. 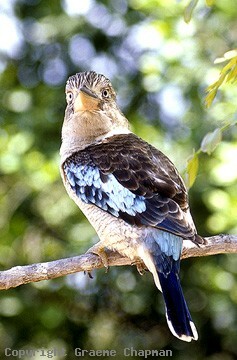 323200 ... Blue-winged Kookaburra, male, with blue tail. 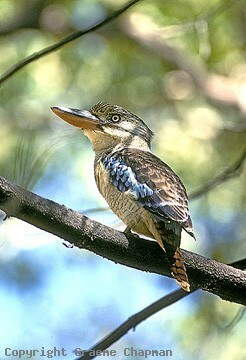 323201 ... Blue-winged Kookaburra, female with brown tail.